Home / Shop / Autumn Edition has Landed! We wanted to reflect all the things we love about autumn, the sound of the leaves crunching underfoot, picking berries whilst on a breezy walk, the smell of apple pie baking, fiery colours sitting atop the trees. This edition includes all of the items you would expect to stumble across whilst on a beautiful autumnal walk, surrounded by nature in the countryside. Whether you want to set off your latest graphic creation, create a flat lay scene to illustrate your fall recipes, showcase your typography, create seasonal images for your blog or website or style a flat lay scene for your product, this edition is an essential for your custom scene collection. Including more than 290 isolated objects, this edition includes autumnal essentials such as blackberries, hawthorne, hornbeam, maple and oak leaves, acorns, pinecones, apples, wood stumps, twigs, moss and many more! 12 pre-made scenes will get you off to a good start as you begin creating your perfect Autumn scene. CONTEST: It’s not the taking part, it’s the winning that counts! And in this contest, everyone’s a winner! 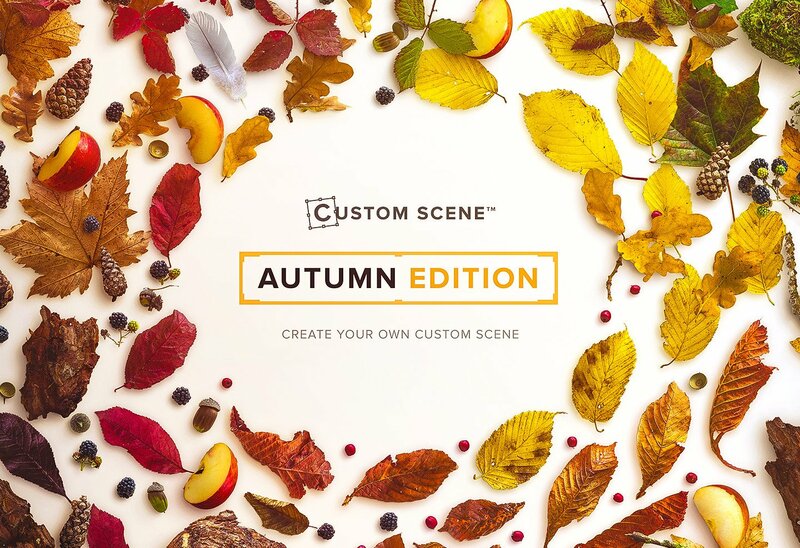 To celebrate the launch of the Autumn Edition, we are giving away one lovely Custom Scener the entire edition… Here’s how to win.. Simply like, share or tweet below, and then tell us what you are most looking forward to in Autumn in the comments… not only will you be entered for the winning prize, but you will also automatically unlock the Autumn Edition demo, which includes 34 handpicked isolated objects along with a beautiful editable Autumn Mockup in JPG, PNG and PSD to give you a taster of the stunning fall scenes that are waiting to be created. Everyone really is a winner! The contest will be running for the first two weeks of Autumn, closing 6th October 2016. You know what to do. I like everything of the Autumn ! The colors of the leaves, the smell of wet earth by rain… is fantastic!! Hey Marivi. It’s definitely a season for all the senses! Thank you. blue is my colour, but never my mood. All that I am, is of this season called Autumn. I’m a big fan of your work! I think my favorite thing about autumn is Halloween, pretty much my favorite holiday of the year! As a kid I loved autumn because of the start of the school. Maybe I’m a kind of nerd, but this was such a great time, when you could plan your weekly activities, extra language lessons and other stuff. We were starting with a clean slate! So even now, after so many years I graduated, autumn is for new beggings. For example this autumn I started running my blog pretty serious. One of my monthly activities on the blog is creating for the readers new desktop calendar. And for October I used your beautiful autumn leafes as part of it! Thank you very much for sharing the demo version. Wow!! We love what you have done with the Autumn Edition.. beautiful! We totally understand the excitement that comes with the “back to school” season. All the best with your blog. The one thing I most look forward to in Autumn is the color change of the maple tree in front of our home. It’s a big tree and it turns the most fantastic golden/yellow. It’s absolutely stunning to stand under it when the sun is shining! I love how the trees change colour. This magic never gets old! Happy Autumn to you and your family~. Thanks Sarah! Happy to hear you’re enjoying Custom Scene.. We would love to see what you have created! This is such a beautiful collection! I can’t wait to play around with the demo version. As for autumn, I always look forward to football season. I’m so glad it’s finally here! Great call, Debbie! Hope you had fun with the demo.